product review Archives « Breastfeed.Babywear.ClothDiaper.Naturally! Breastfeed.Babywear.ClothDiaper.Naturally! Geffen Baby is a Los Angeles-based company that is passionate about their work for babies and the environment. 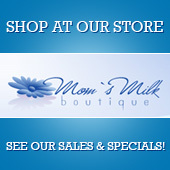 Their products range from cloth diapers to nursing pads. Most of their products–95 percent–are made here in the U.S.A. Their website is super informative and also a great place to shop. (This is dangerous when you’re pregnant and still working on the baby’s cloth diaper stash!) I got the opportunity to try out one of their prefold diapers and tell you what I think. Here’s what I discovered. This is by far the softest prefold diaper I have ever touched. When it arrived at my house, it was packaged neatly and beautifully. I was sent a extra-large jersey prefold with navy blue trim. The color of trim is different by size. The age suggestion is 18 months to potty trained. My son, Levi, is 25 months old, so this was perfect. The prefold is made of 60 percent hemp and 40 percent organic cotton. I seriously could touch this thing all day! I can imagine it has to feel amazing to my little guy’s bottom. The prefolds cost $10.30 a piece, which is a reasonable price for the quality. Levi is a squirmy, opinionated 2-year-old, so getting this prefold on was not the easiest process. It’s probably a good thing I didn’t video tape the drama, but we did get it on his little bottom. There was plenty of extra fabric. I folded the prefold down in the back and did a newspaper fold with a snappi. I then used a econobum diaper cover. The fit worked well for Levi and it was absorbent for his diapering needs. I can’t say I would use this prefold all of the time, just because he is getting to be past the cloth diapering stage for us. With baby number 3 arriving in a few weeks, I am working on getting him used to the potty. However, I will definitely keep it and use it for the baby. 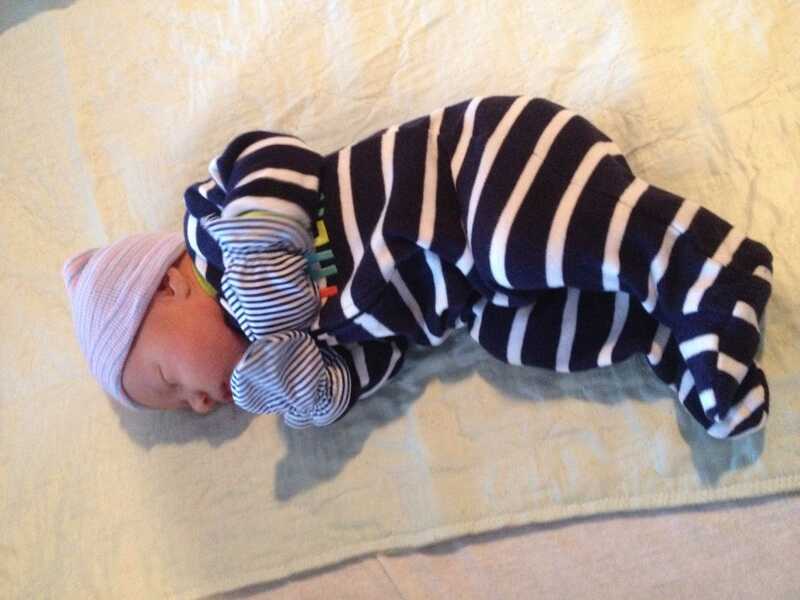 I am not an expert on cloth diapers, but I would definitely give Geffen Baby prefolds two thumbs up. Compared to other prefolds I have used, this prefold is much more absorbent and better quality. I think they are affordable, and the stitching is done well on them. 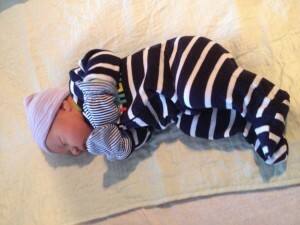 I am definitely going to look into the newborn quick absorbers for my newest squish. They come in a 3 pack and are only $11.07! So momma, if you are into cloth diapering and like prefolds, I definitely recommend trying Geffen Baby. I’m just warning you, these things are so soft! Karyn Meyerhoff is a mom of two, almost three, in Northeast Arkansas where she shops for baby products online way too much. Everyone has something they love. For some women, it’s shoes or clothes. For me, it’s always been purses. So when I was looking for a diaper bag, I knew I needed something big, unique, and amazing. I have been through several over the years, but I keep coming back to my Ju-Ju-Be bags. They are worth every penny and have gotten me through trips, toddler meltdowns, and sticky situations with snacks. Here are some of my favorite products I’ve used from Ju-Ju-Be. Be Quick: These small bags are perfect for keeping your diapering essentials together. My Be Quick has diapers, wipes, and extra clothes inside for quick changes. I also use a Be Quick for snacks in my purse, because I can’t stand for things to not be organized. In the past, I have used these bags for my mommy needs. It’s easy to pull them out when you just need a small bag to run into a store. The wristlet feature makes it easy to take care of your little ones, too. Super Be: This bag is my go-to bag for the gym. It’s huge and spacious for all of my needs including shoes, towels, showering items, extra clothes, kid items, and my water bottle. It’s perfect for a weekend travel bag, too. 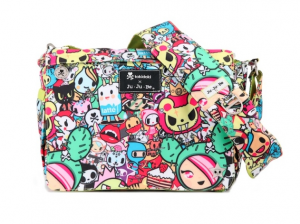 I have this bag in one of the adorable Hello Kitty prints, and I often wish I had about 3 more. It is truly super. BFF: The BFF is just what it says. As a mom of multiple kids, this bag has become my BFF. It can be used as a messenger bag or backpack. It easily wipes clean and has pockets galore. It features a mommy pocket in the front for your phone, wallet, keys, etc. It’s not too big to use daily, but it holds a ton! The prints are beautiful and the interior is just as impressive. I have this bag in the Platinum Petals print and have gotten multiple compliments on it in the past. Be Set: I purchased a Be Set on a whim recently, and I am so glad I did. These 3 pieces keep all of my needs organized in my backpack. I have this in the Royal Envy pattern. I use the large set piece for my mommy needs- wallet, lip gloss, hair brush, keys, feminine products, etc. I use the medium set piece for toys in my bag. It is so easy to pull-out in a restaurant when my kids need entertainment. The small set piece is perfect for make-up or just holding my credit cards when I don’t want to carry in more than needed to a store. There are so many uses for these products. Ju-Ju-Be products are cute, versatile, and something I definitely recommend in investing in. I’m already thinking about getting a new bag for my baby on-the-way! Karyn Meyerhoff is a mom of two in Northeast Indiana where she loves bags of all shapes and sizes. Oh Baby! Have you tried California Baby? Here are my favorite California Baby products. 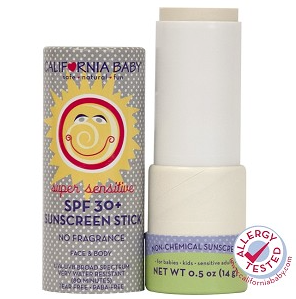 California Baby No Fragrance Sunscreen Stick: We all want our kids to be protected from the sun, and this sunscreen is great. It is a stick, so no messy, globs of lotion to rub in. My picky toddler actually asks for me to put it on before going outside in the summer. It doesn’t have a fragrance, so it’s not perfume-filled or fragrant. It’s SPF 30+, so you can feel at peace with the sun. The ingredients are organic and sustainably grown. Safe for your little one and effective! California-Baby-Overtired-Cranky-Spritzer: This product is an everywhere spray. I use this constantly. I spray it all over the place in my children’s rooms, because who doesn’t want kids that are not cranky! This is a portable aromatherapy. Use it in your diaper bag, your car, kid’s bedrooms, or even in your own room. It can be used on your body, as well, just avoid contact with eyes, of course. The spray can also help with easing menstrual cramps in cranky moms. Bonus! The body washes double as a shampoo. They are effective against cradle cap, eczema, and dermatitis. They are no tears formulas, so no worries if some gets near baby’s eyes. The soothing scents and healing formulas are relaxing and rejuvenating for baby and momma. 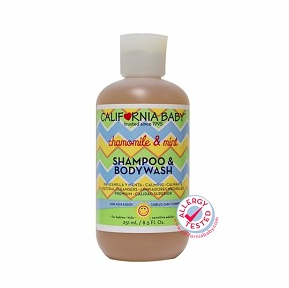 So if you are looking for a new product, try California Baby! I promise you won’t be disappointed and your kids will smell great, too! Karyn Meyerhoff is a mom of two little ones in Northeast Indiana who smell great and are not cranky thanks to California Baby. I have been EAGER to try out a Sloomb Knit Wool Cover by Sustainablebabyish ever since Mom’s Milk Boutique started carrying them earlier this year. After drooling over them endlessly on the website, I finally added one to my cloth diaper stash…isn’t it BEAUTIFUL!?! Believe me, the picture doesn’t even do it justice…it is sooo lovely! While the Sloomb Knit Wool Cover has only been in my stash a short time, it’s already gotten lots of lovin’! One thing I LOVE about wool is that I can use the same cover throughout the entire day. That overall seems to result in less laundry. Plus wool is sooo easy to care for! Yep, that’s right… Wool is EASY! I know, I know… many families admire wool from afar but stay away thinking it’s too complicated. However I assure you that it’s not! You will be a pro at caring for it in no time at all! Wool is wonderful in so many ways and the Sloomb Wool Knit Covers are no exception. They do exactly what you want a high quality cloth diaper to do…contain the mess and keep baby dry, all while looking super duper cute! Plus I love how smooth and soft it is. This wool cover is much thicker than some of the others in my stash, which makes it feel extra plush! The only downside is that it does take a LONG time to dry, but since I don’t have to wash it too frequently it ends up not being too big a deal. I also think a little extra lanolizing will help the cover repel more as well as absorb less water so that is definitely on my to-do list. 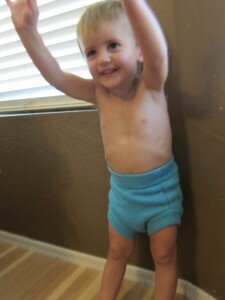 The only, only downside to wool for me is I am adamant that my son wears pants or shorts over it. Usually I am cool with him hanging out in just his diaper, but I am a bit less protective over my other cloth diapers than I am with my wool. I don’t want any paint, mud, tomato sauce, or the like on our wool covers! 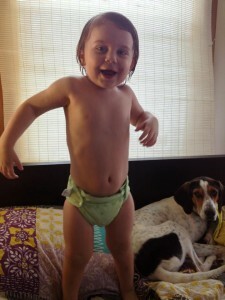 My son has a tendency to take his clothes off (let’s face, what toddler doesn’t want to be nakie!) so I have to watch him extra carefully when he’s in wool to make sure the clothes stay on or the messes are kept to a minimum (which is a bit of an oxymoron with kids, right?). All in all sustainablebabyish makes a wicked awesome wool diaper cover. I am so happy to finally have one in my rotation and am quite pleased with how it has lived up to its reputation! Do you have any Sloomb Knit Wool Covers in your stash? Would love to hear your thoughts!